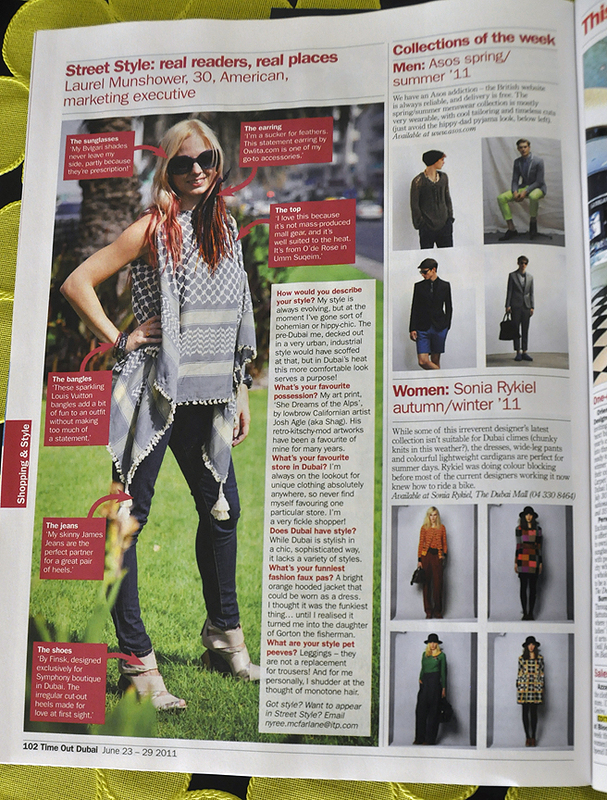 Shortly before heading over to the states I took part in the ‘Street Style’ section of Time Out Dubai magazine. It was fun, minus the 100+ degree heat and obscene humidity. Which killed the time I spent on curling my hair that morning in about 2 minutes flat and left hair and feathers alike plastered to my neck and face. Stunning beauty. Upon my return to Dubai yesterday, I was delighted to see me and my sub-par hair in the current issue; I was worried it might run while I was away and I’d miss it. CLICK TO ENLARGE & READ MY DRIVEL! In other fashion-related news, I happily discovered a boutique called Allsaints Spitalfields whilst in NYC (SoHo). Got some fun stuff there (particularly fond of their ‘festival’ and ‘party’ boutiques), such as heavily embellished shorts that are way too short to be wearing around the Middle East , but hey – let’s test those boundaries anyway. wow now we can get fashion news in a great way.